The Renewable Fuel Standard (RFS) is broken. The problems with the RFS are legion— it is based on incredibly mistaken assumptions about domestic oil production, it gives EPA control over the fuels we use, and increases the cost of fuel. Congress could soon consider two types of reforms to the RFS—either a full repeal of the entire program, or a partial repeal that only would affect corn-based ethanol. A partial repeal of the RFS does not fix the biggest problems caused by the law, and therefore, the entire RFS should be repealed. The RFS was created in 2005 and then expanded in 2007. At the time, Congress and President Bush assumed that oil production would continue to decrease and that America needed to mandate the use of renewable fuel in order to reduce oil imports. Congress and the president were badly mistaken. Since 2007, oil production in the United States has increased by 82 percent. Oil imports from OPEC have declined by 60 percent since 2008. One of the most important arguments for the creation of the RFS no longer applies, as domestic oil production continues to increase. Despite these massively changed conditions, the RFS remains. The good news is that there are some efforts to reform or repeal the RFS. Merely reforming the RFS, including efforts to make corn ethanol ineligible under the mandate, may appear like a good step forward. But in reality, these reforms would not fix any of the real problems with the law. The RFS gives EPA too much discretion, and EPA has abused this discretion time and time again—even doing so illegally. Getting rid of the implied corn ethanol mandate and keeping the Advanced Biofuel mandate will allow EPA to continue to mandate unrealistic amount of expensive fuel, and would certainly lead to higher fuel prices. EPA has shown year after year that it cannot carry out the RFS in an unbiased manner. EPA has refused to set the RFS volume requirements for 2014, even though we are currently well into 2015, and now EPA is months late setting the RFS volume requirements for 2015. EPA has already been sued—and lost—because they used the RFS to illegally promote cellulosic biofuel instead of using a neutral methodology to predict production volumes. EPA cannot and should not be trusted to implement the RFS. Keeping the advanced-only portion of the RFS allows EPA to decide what constitutes “advanced biofuel.” According to the RFS, advanced biofuel must achieve lifecycle greenhouse gas emission reduction of 50 percent compared to petroleum. The problem is that EPA has to certify that a fuel, or a fuel “pathway,” achieves this reduction. Given EPA’s history of ineptitude and illegal behavior, there is no reason to think that EPA will not continue to manipulate an advanced-biofuel-only RFS. Besides allowing EPA to retain too much authority, an advanced-biofuel-only RFS creates the absurd situation where the U.S.—in the name of reducing greenhouse gas emissions—imports sugarcane ethanol from Brazil only to export corn ethanol to Brazil. Brazilian sugarcane ethanol is one of the few certified, commercially-viable “advanced” biofuels. Sugarcane ethanol is not an advanced technology, but instead has low lifecycle GHG emissions because sugarcane is grown in a warm climate. But because sugar cane ethanol qualifies as an “advanced biofuel” it is imported to satisfy the RFS. 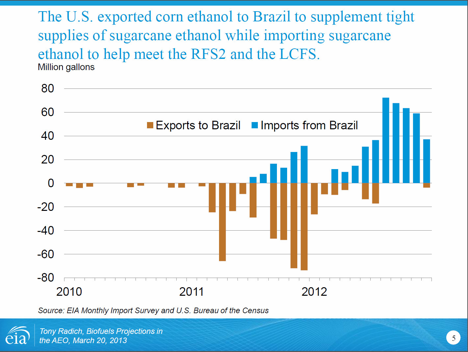 And because Brazil has a large domestic ethanol market, corn ethanol is then exported from the U.S. to Brazil. This is a silly transfer, but more inefficient trades like this would be the direct outcome of an advanced-biofuel-only RFS. Removing the corn-ethanol portion and retaining the advanced-biofuel mandate moves the RFS toward a Low Carbon Fuel Standard. This is because the RFS defines advanced biofuel in terms of the reduction in GHG emissions (estimated by EPA) from making the fuel—regardless of whether or not the fuel is actually an “advance” on past technology. There are real downsides to an LCFS, particularly the cost. One study found that California’s LCFS could increase gas prices by $2.50 a gallon. This is not a future we want to live in. It’s time for Congress and EPA to stop dictating fuel choices to Americans. Congress should take this opportunity to repeal the RFS entirely. One of the biggest problems with the RFS is that it gives EPA a large amount of control over our transportation fuels. EPA has a history of abusing its discretion and EPA’s abuse continues today. EPA has failed to even finalize the 2014 RFS volume requirements even though we are well into 2015. EPA was required by the RFS to finalize the RFS volumes for 2014 by November 30, 2013. While EPA proposed ethanol volumes on November 29, 2013, they have refused to finalize the 2014 volumes. Furthermore, EPA has neither proposed nor finalized RFS volumes for 2015, despite the fact that refiners need to make purchasing decisions. Consumers will be the ultimate victims under this system, since anything the EPA determines to assess refiners will inevitably be passed on to gasoline and diesel consumers. Under a “corn ethanol free” RFS, EPA will continue to have the same discretion. EPA’s refusal to finalize RFS volume requirements shows that EPA has a disregard for the law. There is no reason to think EPA’s actions will change in the future. 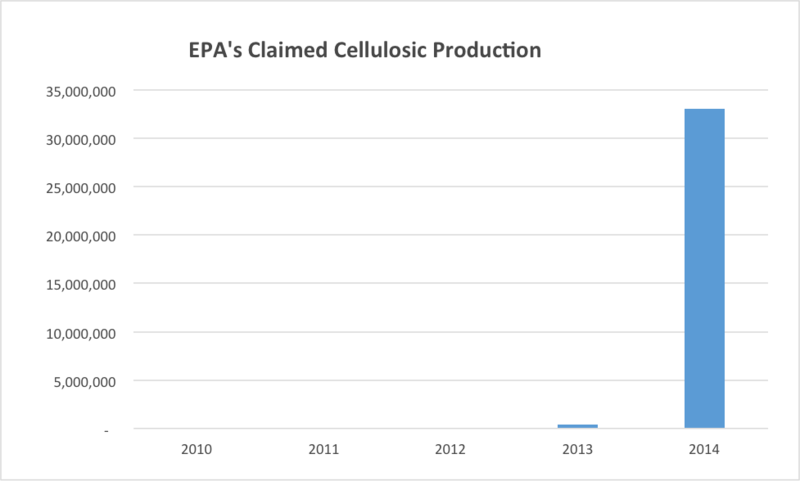 Besides failing to finalize the RFS volumes for 2014 and 2015, EPA has a history of illegally promoting cellulosic production. The law requires EPA, with a neutral methodology, to project the amounts of cellulosic biofuel that will be produced. 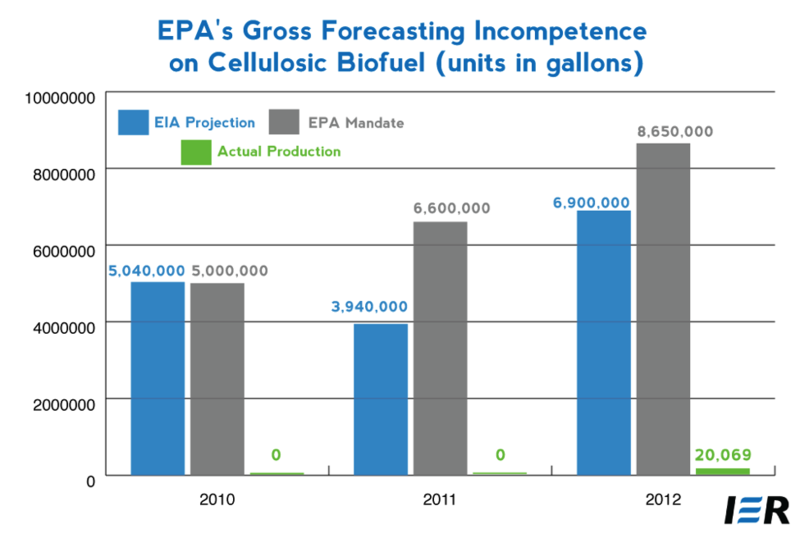 In 2010, EPA mandated the production of 5 million gallons of cellulosic biofuel, but zero gallons were produced. Instead of learning from its mistake, in 2011 EPA mandated the production of 6.6 million gallons of cellulosic. Again, the reality of technology intruded and zero gallons were produced. Because refiners were required to blend this non-existent fuel or pay fines, they sued EPA and won. This is but one example of EPA’s failure to be a neutral observer and instead work to promote cellulosic biofuel to the detriment of refiners and consumers. Cellulosic production has remained low despite promises from the ethanol industry and government officials. In 2007, a Democratic Congress and a Republican president expanded the RFS to mandate cellulosic biofuels. Despite this mandate, and assurances that cost-effective cellulosic biofuel was just around the corner, in 2010 and 2011 no cellulosic biofuel was produced. 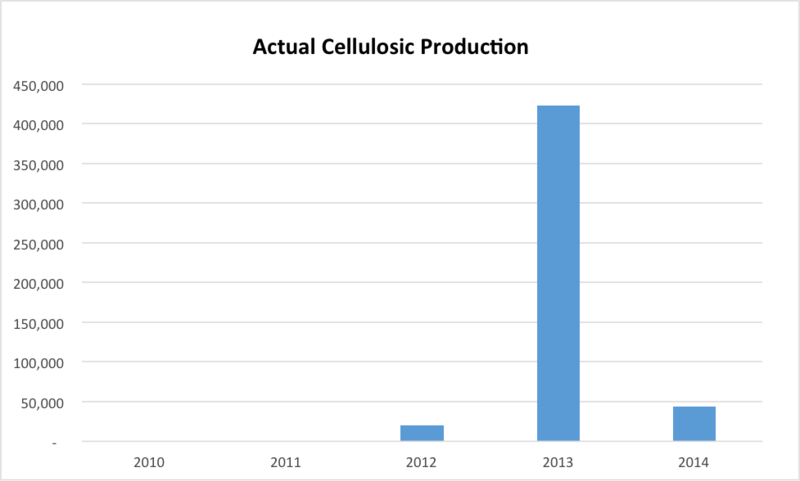 In 2012, only 20,069 RINs of cellulosic were produced and in 2013, 422,740 RINs were produced. While that sounds like a lot, it pales compared to the 1.75 billion RINs mandated by the RFS. Worse, cellulosic production crashed in 2014 back to 44,168 RINs. Note: RINs are Renewable Identification Numbers. One RIN equals one gallon of ethanol, but because some types of fuel, according to EPA, result in greater GHG reductions, one gallon of “advanced” ethanol can generate more than one RIN. Because the mandated cellulosic RINs failed to materialize in the marketplace, EPA decided to redefine what cellulosic biofuel is. The RFS defines cellulosic biofuel as “fuel derived from any cellulose, hemicellulose, or lignin that is derived from renewable biomass and that has lifecycle greenhouse gas emissions, as determined by the Administrator, that are at least 60 percent less than the baseline lifecycle greenhouse gas emissions.” Despite this less-than-clear language, it would appear that Congress meant to define cellulosic biofuel as a “drop-in” fuel to replace ethanol in fuel blends. But because of the anemic cellulosic production, EPA redefined cellulosic biofuel to include some types of natural gas and electricity. Specifically, EPA included compressed natural gas and liquefied natural gas from landfills, municipal wastewater treatment facility digesters, agricultural digesters, and separated MSW digesters, as well as electricity used to power electric vehicles from these sources. Because of EPA’s changes to the original definition, now they claim there were 33,022,061 cellulosic RINs created in 2014. Under the older definition, only 44,168 cellulosic RINs were generated. In other words, CNG, LNG, and electricity from these sources accounted for 99.9 percent of EPA’s claimed cellulosic production. 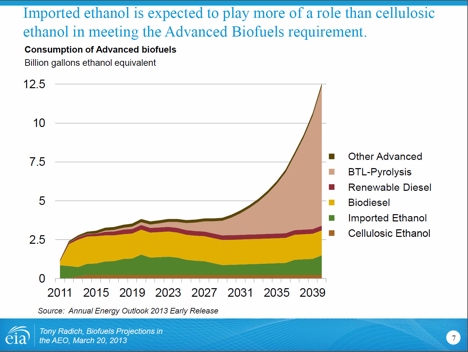 This is troubling because the entire point of advanced and cellulosic ethanol in the RFS is to accelerate technology—not repurpose existing technologies for new government set-asides and credits. EPA’s changes to the definition of cellulosic do not help refiners comply with the law. 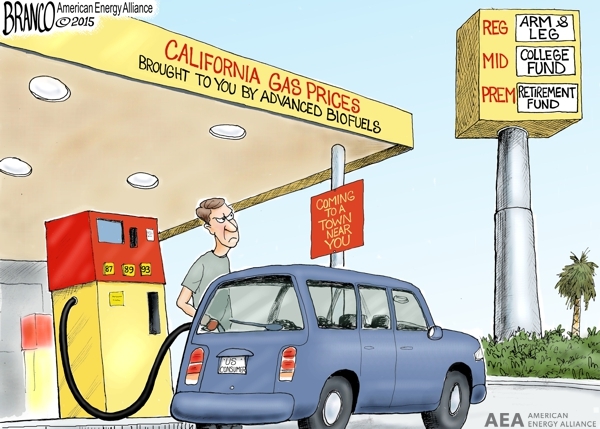 For the refiners who are required by law to blend cellulosic biofuel, this “biofuel” production is not helpful because they cannot blend CNG, LNG, or electricity into gasoline. This situation has become completely absurd. First, sugarcane ethanol is not “advanced.” Sugarcane has been used to make ethanol in Brazil since the late 1920s. The only reason sugarcane is deemed to be “advanced” is because EPA believes it has 50 percent lower lifecycle greenhouse gas emissions than gasoline. The Renewable Fuels Association (RFA), however, does not agree with EPA’s assessment of 50 percent lower lifecycle greenhouse gas emissions from sugarcane ethanol. RFA argues that EPA did not properly consider the greenhouse gas emissions from land use changes in Brazil. Second, while sugarcane ethanol may have lower lifecycle greenhouse gas emissions, any reductions are wiped out by what happens with sugarcane ethanol in the real world. The preference that the RFS sets up for sugarcane ethanol in the United States means that not only is sugarcane ethanol imported to the U.S., increasing its lifecycle greenhouse gas emissions, but corn ethanol is then exported to Brazil, further increasing the true lifecycle greenhouse gas emissions of sugarcane ethanol. When EPA deems sugarcane ethanol an advanced biofuel, they have to consider its true lifecycle greenhouse gas emissions of not only the emissions required to get the sugarcane ethanol to the U.S., but also what replaces that ethanol in Brazil. Swapping Brazilian sugarcane ethanol with U.S. corn ethanol actually results in overall higher greenhouse gas emissions—not lower emissions, which was supposed to be the point of the advanced ethanol provision in EISA. Worse, swapping Brazilian sugarcane ethanol with U.S.-produced corn ethanol is completely wasteful. This swap does nothing, except increase costs and energy use required to swap Brazilian for U.S. ethanol. EIA believes that this absurd trade in ethanol will continue for the next 30 years, with imported ethanol expected to play a much more important role than domestic cellulosic ethanol. Rep. Goodlatte tries to fix some of the problems with the cellulosic portion of the RFS by setting the required cellulosic volumes at the “actual” volumes from the previous year. But given EPA’s track record, it does not nearly go far enough. The immediate issue with setting the cellulosic requires at “actual” levels is which level of cellulosic production is the “actual” level? As noted above, in 2014 EPA changed the definition of cellulosic biofuel. According to EPA’s old definition of cellulosic biofuel, in 2014 44,168 gallons of cellulosic biofuel were produced, but according to the new definition, more than 33 million gallons of cellulosic biofuel were produced. This is huge difference and calls into question why the federal government is in the business of mandating varying amounts of biofuel. The best answer is to leave it up to people to figure out what works instead of Congress trying to micromanage fuels. Another problem with this approach is that if a cellulosic ethanol plant is actually built and then produces some cellulosic ethanol, this language would mandate that Americans buy the products of that plant. This is un-American. The government should not force citizens to buy a product. If Congress were to repeal the implied corn-ethanol portion of the RFS, it leaves behind an advanced-biofuel-only RFS. As noted above, the RFS defines advanced biofuel by EPA’s estimate of the GHG emissions from the making of the fuel. This means that an advanced-biofuel-only RFS makes the RFS essentially a Low Carbon Fuel Standard instead of a renewable fuel standard. The RFS is fatally flawed. Ending the RFS, including the advanced biofuel portion, does not mean that ethanol would no longer be used in the United States. It means that EPA would have less impact on the fuel market, that the absurd and inefficient Brazilian-U.S. ethanol swaps would be reduced, and that the American people would balance the competing uses of corn instead of the federal government dictating a certain amount of ethanol and other biofuels. The RFS is bad policy. Both the corn ethanol portion of the RFS and the advanced biofuel portion of the RFS are bad policies. The best course of action is to let people figure out what fuels work best instead of being told by Congress and EPA bureaucrats what fuels to use—regardless of whether the fuels actually exist or not. Technically, the RFS does not mandate the use of corn ethanol. The RFS has an overall volume requirement and smaller requirements for “advanced biofuel.” Ethanol made from corn only counts toward to the overall volume requirement. Agriculture.com, Cellulosic ethanol could be just around the corner this time, Feb. 7, 2007, http://www.agriculture.com/crops/renewable-energy/ethanol/Cellulosic-ethanol-could-be-just-around-the-corner-this-time_192-ar2111. Environmental Protection Agency, RFS2 EMTS Informational Data, Feb 9, 2015, http://www.epa.gov/otaq/fuels/rfsdata/2015emts.htm. Voluntary Quality Assurance Program for Verifying the Validity of Renewable Identification Numbers Under the RFS Program, June 2014, http://www.epa.gov/otaq/fuels/renewablefuels/documents/420f14042.pdf. Note: Under the RFS2, advanced biofuels achieve a lifecycle GHG reduction of 50 percent from conventional fuels and cellulosic biofuel achieves a reduction of 60 percent from conventional fuels.